The 13-day siege of the Alamo Mission has been the subject of at least a dozen movies, not the least of which is The Alamo (1960), starring, directed, and passionately produced by John Wayne. To score this romanticised look at the battle for Texan independence, Wayne turned again to Tiomkin who received an Oscar for his score for Wayne’s The High and The Mighty (1954). For The Alamo, the composer produced a rousing score, highlighted in the suite by the Overture, the Davy Crockett theme and the Battle music. Wayne and Tiomkin also knew a song was needed for the last goodbye as Santa Anna’s forces make the final assault. Wayne said, ‘We need a serious song, a song that says it is time to die, time to leave’. Tiomkin and lyricist Paul Francis Webster wrote ‘The Green Leaves of Summer’: ‘A time just for plantin’, a time just for plowin’ … A time just for livin’, a place for to die’. 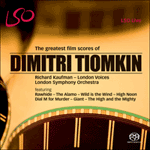 Tiomkin was nominated for an Academy Award for his score and, with Webster, for the haunting song.